The hospital is on the A4260 Oxford Road at its junction with Hightown Road, about two thirds of a mile south of Banbury town centre and about 100 metres north of Sainsbury's store. It is signed at the junction with Hightown Road. There are five Pay & Display machines in the patient/visitor car parks. Park and go to the nearest machine. You can pay with cash or by card. No change is given, so please pay the correct amount for your expected stay, take a ticket and display it inside the windscreen of your car. Coins taken: 10p, 20p, 50p, £1, £2. The car parks are run by the Trust, and not as a commercial operation. All money raised goes directly back to patient and visitor services. There are extra-wide parking bays for Blue Badge holders only, which allow for wheelchair use. There are 24 disabled spaces available, but if these spaces are full you can park free of charge in any Pay & Display car park if you display your Blue Badge. Located on the left hand side as you drive in the main entrance, off Hightown Road. Opposite the medical wards Oak and Juniper and a few minutes walk from the A&E department and main entrance. Located on the right hand side as you drive in the main entrance, off Hightown Road. Opposite the Maternity Unit. Located outside the Maternity Unit main entrance. 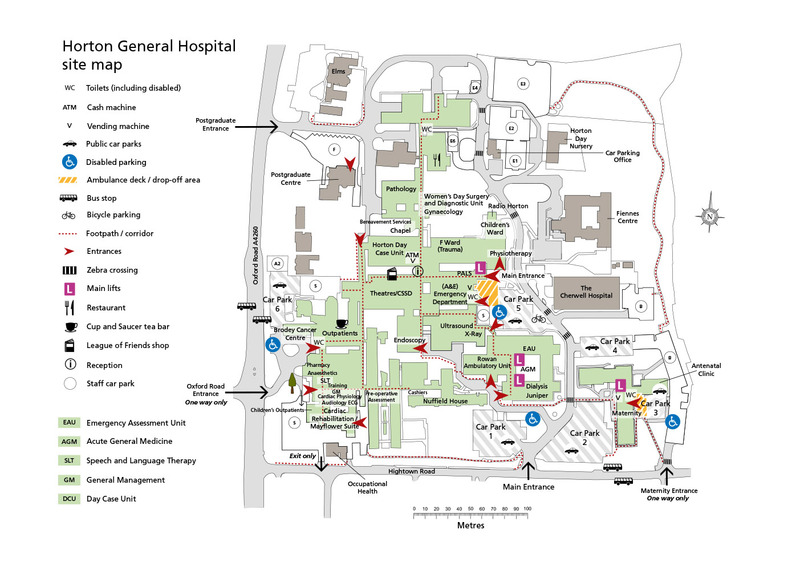 Located next to the Horton Treatment Centre, opposite the A&E department and medical wards. Located in front of the A&E department and medical wards. Located on the left hand side as you drive in the Oxford Road entrance, near Outpatients, Brodey Centre, Cardiac Investigations, Audiology, Cardiac Rehabilitaion gym and Pharmacy departments. Monday, Tuesday, Wednesday and Friday 8.30am - 12.30pm and 1.30pm - 3.30pm. If you have questions about car parking or encounter problems with parking please contact us.